Posted 29. 10. 2013 by Jens Arps filed under Experiments in Web, How to. 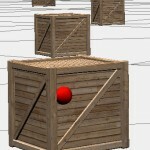 Roughly a year ago, I wrote about detecting COLLADA models with a three.js ray caster. That code was written for three.js revision 49 – whereas the current revision is 62. A lot of things changed since then, and the code no longer works. So, here is an update of that post for revision 62. If you don’t come here from that previous post, here’s what this is about: When the user clicks somewhere on the screen we want to find the object in the scene that is actually being “clicked on”. More precise – we want to know when a user clicked on an imported COLLADA model. The most straight forward way to achieve this is to do ray casting. 1. The performance and memory efficiency of three.js’ built-in ray casting classes have greatly improved. 2. The built-in raycaster is able to detect COLLADA models without any further modifications. The main ideas behind the ReusableRay class made it into three.js’ Raycaster class. Effectively, that means that there is no more need for the ReusableRay class that I recommended to use for prior revisions of three.js. Win! If you compare the source code of the two collada_picking_ray versions on GitHub, you’ll see that it’s almost identical. Let’s go through the code again step by step; If there are changes to the previous versions, I’ll put a bold “Changes to R49:” below the code so that you can quickly skim through the post. The first thing we do is to record the mouse event. We do not react to it right now, because we don’t want to do anything outside of the render loop, so we keep control about what happens when. Changes to R49: No more new ReusableRay() – instead, we create a new instance of THREE.Raycaster that we can re-use. Changes to R49: Method name change: Vector3.subSelf() now is Vector3.sub(). // Now our direction vector holds the right numbers! Changes to R49: Like ReusableRay, Raycaster has a method to set the source and direction of the ray – and it takes the same arguments. So it’s an easy change: instead of ray.setSource(), just call raycaster.set(). We can now ask the ray class for intersections, and it will report back all objects that intersect with our ray. Intersections are ordered by distance, so in this case, we only need the first one we get. The first argument is an array of objects that are possible candidates for an intersection. I recommend to optimize this, but for this example, I’m just passing all the scene’s children. If you have imported COLLADA models in your list of candidates, you need to set the second argument to “true”. // face belongs. We only care for the object itself. Changes to R49: The top level object of the imported COLLADA still is a plain Object3D instance; but the new ray caster can dive down recursively into the objects and will find the mesh that the ray hit. To do this, the second parameter, “recursive” must be set to true. And that’s it – Mouse-picking COLLADA models has become really easy!